A new ultra-widefield retinal camera can save sight by improving early detection of common causes of vision loss. This latest advance in technology takes photographs of a large span of the retina’s outer edges, leading to a better understanding of how different conditions affect all parts of the retina. Some of the first signs of eye disease and systemic disease can be seen in the retina before they cause other symptoms, including vision loss. 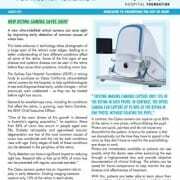 The Sydney Eye Hospital Foundation (SEHF) is raising funds to purchase an Optos California ultra-widefield retinal camera for the hospital, to help ophthalmologists to see and diagnose these early, subtle changes – which previously went undetected – so they can be treated before sight loss occurs. Demand for excellent eye care, including for conditions that affect the retina, is growing, says Kevin Gardner, the SEHF Chief Executive Officer. “One of the main drivers of this growth in demand is Australia’s ageing population,” he explains. More than 85% of vision loss occurs in people aged over fifty. Diabetic retinopathy and age-related macular degeneration are two of the most common causes of vision loss worldwide and the risk for both conditions rises with age. Early stages of both of these conditions can be detected in the periphery of the retina. The Optos camera system has an important role to play in early detection. Existing imaging cameras capture only 15% of the retina in each photo. Scattered light and obstructions such as cataracts, corneal pathology and astigmatism can reduce the quality of the photo. Patient’s pupils are dilated with eye drops in an attempt to improve the images, causing the discomfort of blurred vision and light sensitivity for some time after the examination. 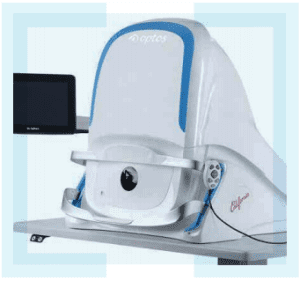 In contrast, the Optos camera can capture up to 80% of the retina in one photo, without dilating the pupil. Photos are quick, painless and do not cause any discomfort to the patient. A bonus for patients is that we dramatically cut the time they have to spend in the clinic as they don’t have to wait for the pupil-dilating eye drops to work. Photos are immediately available so patients can see exactly what the doctor sees when examining the eye through a high-powered lens and provide objective documentation of clinical findings. The photos can be saved for future comparisons to help monitor the eye disease and effectiveness of treatment. With this, patients are better able to learn about their eye condition and treatment options and to make informed decisions about their eye care. “At $155,000 for the Optos camera system, we think it’s a great investment that will benefit the 10,000 people with retinal conditions that the hospital sees each year,” Mr Gardner said. Every now and then we come across patients with complicated eye health problems which are particularly difficult to treat. Thankfully, as new technology develops, we are given the opportunity to meet these challenges more effectively. We have just purchased the Intraocular Endoscopy Equipment for the Eye Hospital Theatres. Pictured, right, are doctors using this equipment, which now makes it possible for us to handle cases that would traditionally be considered inoperable. Endoscopic vitreo retinal surgery is a rarely indicated procedure. Some cases involve eyes that have multiple problems and a poor prognosis. On other occasions, endoscopy makes it possible to salvage vision where other techniques cannot. It can lead to a simple solution for what otherwise would be a complicated problem. Clearly the team were keen to acquire the equipment but the biggest challenge was fi nding the funds to add it to their arsenal. Thanks to your support, we have been able to provide $43,000 to purchase the actual equipment that was used in the trial for Sydney Eye Hospital (at considerable discount). We believe the system, which includes numerous state of the art components, is the only one of its kind in Australia, once again placing Sydney Eye Hospital at the absolute forefront of eye surgery.